If you've ever walked through the gardening section of a hardware store, chances are that you've seen neem oil on the shelves. The ingredient seems to be popping up everywhere and being included in just about every "green" product on the market. But what is neem oil? Is it safer than the usual chemical-based options? The companies selling the stuff would LOVE you to think so, but is it actually worth your time? The aim of this guide is to layout all the facts about neem oil, its benefits and uses, then dive into some of the safety concerns to help folks understand this ingredient at a deeper level before you start using it. What Are The Uses of Neem Oil? How Does Neem Oil Work To Control Pests? Which Products Use Neem Oil? When Should You Consider Using A Neem Oil-Based Product For Pests? Is Neem Oil Dangerous Around Humans? Is Neem Oil Dangerous To Cats? Is Neem Oil Dangerous To Dogs? What Does The Government Think About Neem Oil? Neem oil is a naturally occurring insecticide distilled from the essence of the seeds of the neem tree, which was originally found in the eastern countries India and Burma. Today, the tree has been exported to many other parts of the world (like Saudi Arabia, the Caribbean, and etc) to facilitate increased production of the popular oil. It's becoming increasingly popular as a topical (skin) application and insecticide among its many other uses. 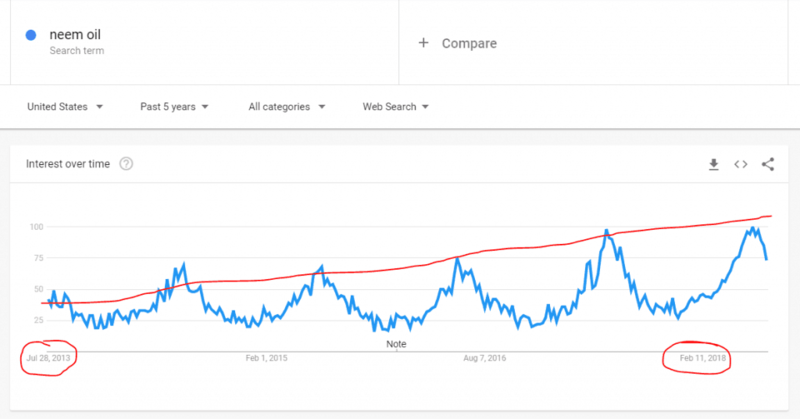 Below is a chart pulled from Google Trends to give you an idea of the difference from 2013 to 2018. The most active ingredient in neem oil is azadirachtin but other ingredients worth noting are nimbolinin, nimbin, nimbidin, nimbidol, sodium nimbinate, gedunin, salannin, and quercetin, which all play apart in making the stuff awesome. Neem oil has shown promising insecticidal, fungicidal and bacterial properties, with minimal side-effects. It's also rich in antioxidants, making it useful in preventing free radical generation and preventing diseases. Below is a quick graphic providing a quick overview of this popular chemical. Keep on reading to get our full breakdown. What Is Cold Pressed Neem Oil? Neem oil also goes by the more technical term, "cold pressed neem oil". To understand the meaning of "cold pressed oil," it's essential to have a basic grasp on how oils are extracted in the first place. Normally, a manufacturer will use an expeller tool to extract the oil out of its original fruit, nut, or seed. In this case, we're talking about neem seeds, so the manufacturer of neem oil will use an expeller on the neem seeds—creating friction and, therefore, heat. A cold pressed extraction, on the other hand, doesn't create the same tension and heat. While an expeller is still used, the heat is controlled by strict temperature settings in order to preserve the oil's natural flavor notes. An oil can be considered cold pressed if it's extracted at a temperature below 120 degrees Fahrenheit/49 degrees Celsius. For a more in-depth explanation of this process (as well as some of the pros and cons of cold-pressed oils), check out the video below! Yes, neem oil is organic! As mentioned, true neem oil is extracted from the seeds from the fruit of the neem tree. The fruit is about the size of a small olive or grape, turns golden yellow when ripe, and contains 10-30% oil. Is Neem Oil Garden Safe? Yes, neem oil is commonly recommended as a garden-boosting product to keep plants healthy while shielding them from the bites of bugs. In fact, neem oil is considered a horticultural oil—in other words, a plant-based oil. The active ingredient in neem oil, Azadirachtin, works especially well to protect plants from pests, especially predatory ones like aphids and mites while preserving non-target beneficial insects. On top of that... Neem oil can also be used as a biofertilizer facilitating the nitrogen intake of plants helping them grow. So yes, very safe in your garden! Now that we've covered some of the high-level basics on what neem oil is, let's take a closer look at some of its benefits and why people are getting excited about this chemical. First, ever heard of antioxidants? Neem oil has been found to contain antioxidant properties capable of reducing free radicals, which helps with preventing diseases. As you can see, there's a lot of of going on with neem oil. Even the neem tree itself is being used for re-forestation efforts to stop ever expanding spread of the Sahara desert. The tree is extremely resilient, which allows it to grow in drought-prone soils! If you live in Florida or Puerto Rico, you've probably already seen one or two while driving. Now that we've covered some of the high-level benefits, reviewed various tests of neem oil products in the field, let's have a look at practical use cases on neem oil being deployed today. Many companies are quickly integrating this ingredient in various product lines trying to capitalize on the "eco-friendly" marketing angle. From pest control, to fertilizer, and even face wash, it's popping up everywhere! Let's break down a few places where neem oils being used most often. As mentioned throughout this writeup, neem oil is great for pest control especially when trying to protect crops and gardens meant to bear food. Neem oil can be sprayed in and around the garden to protect your plants from insects like mites, aphids, thrips, and whiteflies. You can buy these as concentrated forms of the oil itself, or as neem oil extract sprays (which are slightly milder). Neem oil garden sprays are sold as fungicides so that you can reap in the gardening benefits of neem oil while also protecting your garden against fungi. As mentioned earlier, Neem Oil is also being used biofertilizer facilitating the nitrogen intake of plants helping them grow. Terramerra is one company leading the charge bringing many products (like Proof Bed Bug Spray and Neem Fertilizer) to market containing the base ingredient neem oil. Many retailers sell soaps, skincare-grade oils infused with neem, and lotions with neem oil in order to lock in the benefits of neem oil for skincare. For example, a popular product made in Italy, "Holoil", which is a mixture of Hypericum flower extract and neem oil is being used to treat skin disorders related to chemotherapy and diabetes! As much as we like theory and potential solutions, we REALLY like first-hand studies and proven tests of products out in the field. Check out a couple interesting studies of neem oil we found below. The first test we thought was interested is using neem oil to combat malaria. If you didn't already know, mosquitoes are among the deadliest insects on the planet. One method of destruction they employ is spreading malaria. The World Health Organization (WHO) reported 438,000 malaria related deaths in 2015 alone! 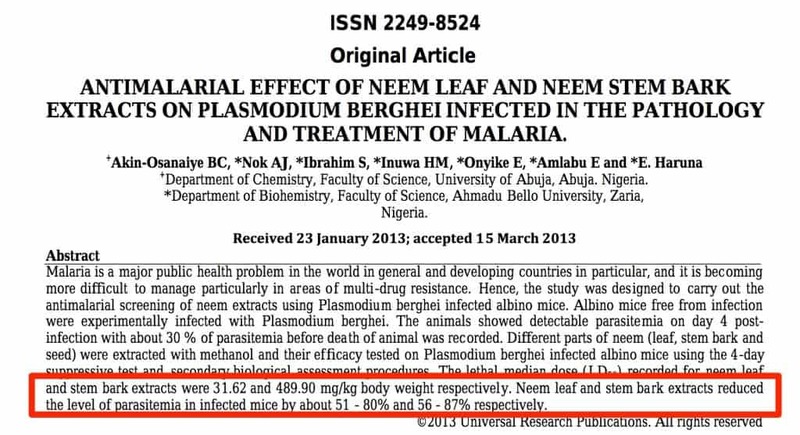 A promising study was published in 2013 comparing the effect of neem oil on malaria infected mice to standard medicines being used to treat the disease (i.e., arthemeter, quinine, chloroquine). The results of the study found that using neem leaf and stem bark extracts reduced infection levels by about 51–80% and 56–87% respectively compared to traditional malaria treatments (source). Below is excerpt of the abstract from the study for reference. Another study published a couple years earlier in 2010, showed that the use of neem oil was ineffective against malaria. The test was conducted in a similar fashion comparing neem oil to traditional medicines, but again, less than stellar results (source). The jury is still out on whether neem can work as malaria treatment but things are coming along. Another interesting experiment tested how well neem oil fared against 48 different strains of E-Coli. Samples were taken from milk and cheese, feces of calves and pigs affected by diarrhea. Gross, but necessary to determine effectiveness! Perhaps the best use case of neem is its ability to kill target pests and preserve crops needed to feed humans without threatening wildlife. As much as we hate to spray our food with chemicals, the fact of the matter is if crops are left unprotected, they will be eaten by bugs. The challenge is balancing the strength of the chemical used and its effect on human health and environmental concerns. The U.S. Department of Agriculture (USDA) conducted a trial spraying soybean leaves with neem oil and testing how well they fared against Japanese beetles. The treated leaves were untouched while the other leaves (not sprayed with neem) were consumed in under 48 hours. Another study was administered in multiple soybean fields out in Ohio. The test was conducted by spraying one field with neem oil while the other field was left untreated. If we looked at every test of neem oil, we'd be here all day, so here's a quick list of more studies for your reading pleasure. Hate stink bugs? Here's a study showing that neem oil can be a great solution. A test in Ethiopia comparing the effectiveness of DEET vs Neem Oil. Various skin disorders can occur as a result of chemotherapy. Here's a study showing the positive effects of neem oil on these types of patients. Given how popular it is becoming for the specific use of pest control (and the fact that Pest Strategies helps with pest problems) we wanted to dedicated a section specifically discussing how neem oil works to control problem insects. As discussed throughout this guide, neem oil contains as many as 100+ biological active compounds, but the most significant in controlling pests being Azadirachtin. Think of azadirachtin as pest birth control. In more scientific terms, it is an insect growth regulator (IGR) hindering the development of insects in the larval stage. As a results of this disruption, the life cycle of the pest is interrupted, and the insects very quickly die off after first exposure. This is important but what's even more important is that Neem Oil has the potential to provide a nontoxic and sustainable replacement for chemicals used in food production. Because it is what is known as a "botanical pesticide", which means it's biodegradable and leaves no harmful residues after it dissipates. Below is one example of the effect neem oil has on stink bugs. 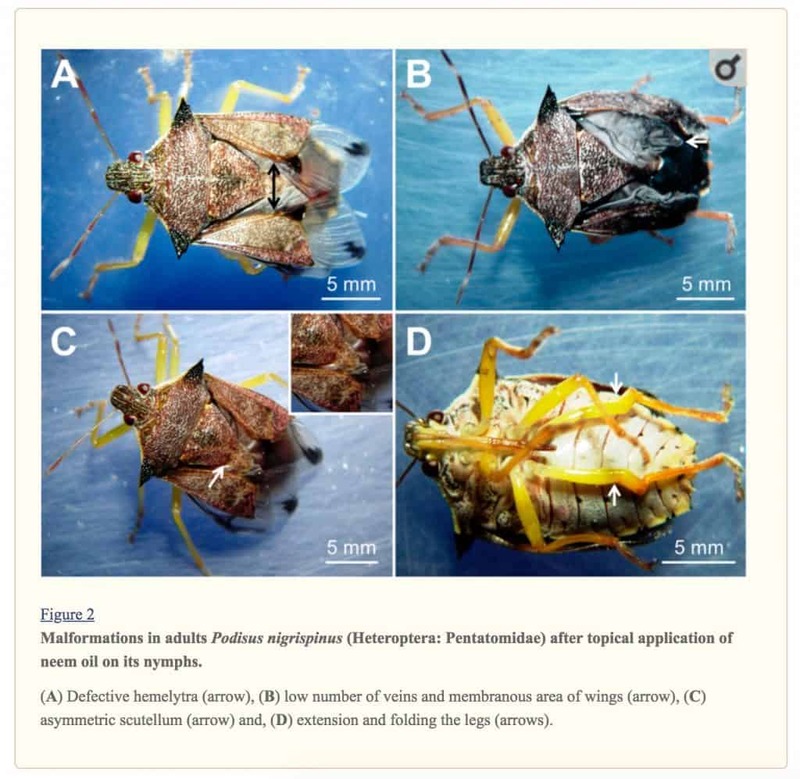 In this particular example, researchers were evaluating the toxic effects of neem oil to a non-target pest (stink bug) when trying to protect crops. It is important to understand that Neem Oil is biodegradable because conventional insecticides often require additional infrastructure and costs in order to properly deploy them without harming the environment or poisoning crops. But... it's not all great. Even though Neem Oil has many redeemable qualities, it still has a way to go as a complete replacement for more synthetic options. For example, Neem Oil is slow to kill and quickly dissipates meaning it needs to be reapplied to protect crops (sometimes in under 3 hours!). Something else to note is that depending on the extraction method from the seed, the actual composition of the insecticide can vary making it hard to scale production. Which Pests is Neem Oil Best For? Is neem oil a better buy than a big-box chemical product? Check out how it fights off these common pests! In over 800 cases of scabies, a severe and painful skin condition, ground neem leaves were tested for efficacy. In 98% of the victims, the scabies cleared up completely within 3-15 days. The United States Environmental Protection Agency currently lists neem oil alongside several heavy-hitting chemical pest control products as an approved method of eradicating bed bugs. The EPA's recommendation proves that neem oil can hold its own when compared to traditional chemical-based products for bed bugs. Neem oil is primarily effective on aphids and recommended on a wide range of gardening platforms as a way to eliminate these garden pests. This oil smothers the aphid with its active ingredient, azadirachtin, and disrupts its life cycle almost immediately. For a further explanation, check out the video below! Neem oil has been shown to kill fleas. In fact, its active ingredient acts in much the same way toward fleas as it does toward aphids and other insects: the azadirachtin effectively stops the growth process during the larval stage of development and kills off the flea infestation. Overall, neem oil is safe around humans and children so long as you do not ingest it. If ingested, neem oil can induce vomiting and drowsiness. As a reminder, neem oil contains mostly glycerides and fatty acids. These are the same elements of food-grade oil. After a bit of digging, we did find a number of cases of neem oil poisoning. One of which includes a 73 year old man of that was admitted to the emergency room complaining of vomiting and drowsiness after accidentally ingesting 20 ml of Neem Oil. He stayed in the hospital for 1 week before completely recovering and being discharged. There have been studies on neem oil's flea-killing benefits to cats, however. In these studies, many of the cats grew ill and in rare instances, some cats even died from exposure to neem oil. After the neem oil was removed from their bodies, though, most cat recovered within 5 days of the experiment. However, this shows that neem oil is absolutely harmful to cats and shouldn't be stored anywhere that your feline friend can accidentally reach. Neem oil is not listed as a toxin as per the ASPCA's website, however, this doesn't mean that it is totally non-toxic. Given its stark and concerning side effects to cats, we recommend using extreme caution when exposing dogs to neem oil, or garden treated with neem oil products. If you're not sure whether neem oil will affect your dog, be on the safe side and ask your veterinarian. Something we like to do for all our chemical write-ups is review what the Governmental regulators think. In the United States pesticides need to be approved by the Environmental Protection Agency (EPA) before being sold to the public. The EPA will also set allowable residual tolerances on the food the chemicals are used on. Those tolerances are enforced on domestic and imported food products by the The Food and Drug Administration (FDA) and the the Food Safety and Inspection Service (FSIS) of the U.S. Department of Agriculture (USDA). There's lots of Government oversight when these products come out of the woodwork. In our research, the EPA fully recognizes the pesticidal benefits of Neem Oil. They've published a fact sheet on cold pressed neem oil (aka Neem Oil) noting that it poses no risk to human health or risk to the environment. In essence, this means that because of its natural and non-chemical composition, neem oil gets the recognition from the EPA as a pesticide without having to go through the hassle of regulations that its chemical counterparts must undergo. Here's a link to the full fact sheet for reference. Now that we've reviewed neem oil on its own, we like to include a section comparing it against other similar products and/or terms people often use to describe it. There's a lot of confusion out there and in this section we break down some of those common questions swirling around the internet. To clarify, this section isn't meant to dive into every nuance but provide a high level comparison. The first one is a bit silly but makes sense. People hear the technical term "horticultural oil" and get confused thinking it's its own product when in reality neem oil and horticultural oil are one in the same. You see, "horticultural oil" is an umbrella term for oils made from petroleum products to control pest populations. In some instances (as in the case of neem oil), horticultural oils can be infused with plant essences as well. Well, these two come from different trees on different continents. Neem oil is extracted from the seeds of the neem tree while tea tree oil is taken from the paperbark tree, which is native to Australia. While both products are gaining popularity as natural solutions to pest problems, tea tree oil is seen more as an anti-microbial/fungal product made for topical applications in 5-10% concentrations (like hand soap or face wash). For example, in clinical trials testing TTO as an acne treatment, TTO performed at the same level as benzoyl peroxide while producing less overall side-effects such as dryness and scaling. Organocide, for those who aren't aware, is actually name-brand insecticide and fungicide that works in many of the same ways as neem oil does. However, the differences start to show up when you look at the ingredients of Organocide: its active ingredient is refined fish oil at 92% whereas neem oil is an ingredient in itself. For pest control, skincare solutions, and fighting toxins inside and outside the home, Neem Oil really can't be beaten. You can use it to beautify your garden as well as your skin, and save some to ward off mites and aphids at the same time. However, if you're a pet owner, it is worth keeping a watchful eye on your cat or dog anytime you employ neem oil in your home or backyard. It can be toxic to cats and potentially harmful to dogs, so use your best judgment. Very nice article. He is very edifying. Thank you for publishing your research.